A faire inspired by our Renaissance Collection. Renaissance era attire encouraged! 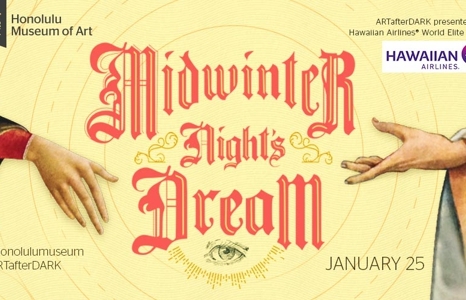 A Midsummer Night's Bollywood Dream performance and dance workshop by Aaja Nachle Hawaii. P∆G∑ performs atmospheric dream rock. Vision District presents an immersive experience performed live by Jos Vision. Beer, wine, and a specialty cocktail by Free Spirits Mobile Bartenders. Specialty cocktail: Juliet's Last Kiss, Jameson's Irish Whiskey, mint, lime, and apple cider. • Lot behind the Honolulu Museum of Art School (1111 Victoria St.), enter from Beretania or Young Street. Lot closes promptly at 11pm.